The Southern Oscillation Index [SOI] for August was +1. The official monthly SOI for July was +2, thus not much change, in the El-Nino position, which is linked to the SOI Index. Most indicators suggest an El Nino event is developing across the Pacific Basin. SST conditions indicate that they should they persist at such levels through the next 2/3 months. This will be considered an El Nino year. El Nino indicators include central and eastern Pacific Ocean surface temperatures around 1C above average, and there has been a poor fallout to the southwest monsoon season . According to the Australian Met Dept, the SOI is more positive than one would expect for a developing El Nino situation. El Nino events are often associated with drier than normal conditions over large parts of the Australian continent, and lesser developments of systems from the South China Sea towards the Bay of Bengal. Thus, poorer rainfall results in the Indian region. The onset of the monsoon over Kerala took place on 23rd. May, about 7 days earlier than the long-term average date. 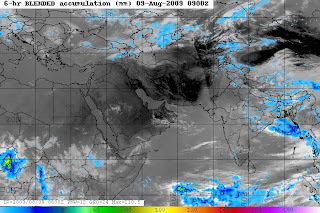 Rains were then below average over most of the Indian sub continent during early June, consistent with an inactive phase of the MJO over that region. Rainfall has generally been scanty over much of the sub-continent in July too, as the MJO signal has generally been weak. The MJO signal currently continues to be quite weak. This technicality is mentioned in this blog by me to stress upon the prevailing very low rains in the sub-continent region. An upper Air Circulation has developed in the northern bay on the 9th. The attached SSt map shows not much "above normal " temperatures in the bay waters. As a result, the low "aloft" is not expected to descend to lower levels yet, and will move west and precipitate fair amounts of rain , in a narrow corridor along N. Andhra towards Vidharbha on Tuesday, and M.P. on Wednessday. Future course, we will monitor, and predict later, but it should weaken and bring some rain to north-west india. But, in the meanwhile, what should be actually awaited is a low at sea level. Currently, the rains in all the region remains poor. The rainfall map for the 9th. shows the picture of actual ra in. With the monsoon axis stuck in the foothills of the Himalayas, the rains all over the region baring, the eastern end of the axis, will be subdued. Not much rains for Mumbai on Monday/Tuesday. Some showers in parts of the city, with a rainfall of 5-7mms per day. 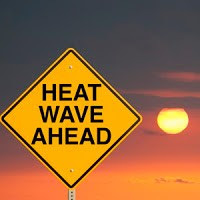 Hot and stuffy conditions will make the "real feel '' uncomfortable. Excellent blog. I loved your discussion of local weather around India. What you think of this guy -Piers Corbyn weatheraction.c o m, youtube channel "1weatheraction". He claims to be more accurate than many weather forecasters - and has predicted many storms in the Bay of Bengal in August. I would like to hear your views on him. Ray, actually I had heard of his site, but ,frankly, never really followed up his forecasts. Intend to do so now, as you have reminded me of his forecasts.shall come back to you, if you can give me ur contact.